Is it possible to stop bullying in our schools? These harrowing words come from a young women who was relentlessly bullied for years. You can read her story here. Bullying in our schools is a serious issue that seems to be rearing its ugly head more and more these days. The stories are horrible and my heart goes out to the victims and their parents. I cannot imagine anything worse than sending your child off to school knowing that it is not a safe place for them. In 2013 The United Nations Children’s Fund (UNICEF) published a report comparing children’s well being in developed countries. When it came to bullying Canada came in 21st of 29 nations. We are in the bottom 10! the same report states that only 58 % of Canadian children interviewed experienced their classmates as kind and helpful. That means that 42 out of every 100 Canadian children go to school expecting their classmates to be mean and unhelpful. How mortifying for a country whose citizens have a reputation for being nice. If you want to see more statistics for Canada you can find them on the Canadian Red Cross website and the Government of Canada Public Safety site. Perhaps the best way to understand the impact of bullying is to read some of the personal stories that have been published on the Internet. According to the researchers at Prevnet Canada the impact of bullying is both immediate and long-lasting. It has an impact on victims, those who bully, and on those who witness bullying. As if this isn’t bad enough bullying in schools can also impact family relationships. What about our schools anti-bullying programs? Most schools are trying their best to respond to an overwhelming number of demands with limited resources. The good news is that there is an increased awareness of the harm caused by bullying. Many of our schools have policies stating that bullying behavior is unacceptable and there are anti-bullying programs in place. In fact it is a multi-million dollar industry. Unfortunately in spite of the all the money being spent too many children are still being targeted. Too many young lives are still being damaged. Realistically I’m not sure it will ever be possible to eradicate it completely. Still I think that we can do a lot to address the issues. I believe there is a problem of perception. As a society we tend to look at bullying as something that happens between individuals. It is regarded as an isolated problem between a bully (or bullies) and the victim. We need to recognize that while the actual incidents of bullying occur between a two or more players it is our culture that permits it to occur. 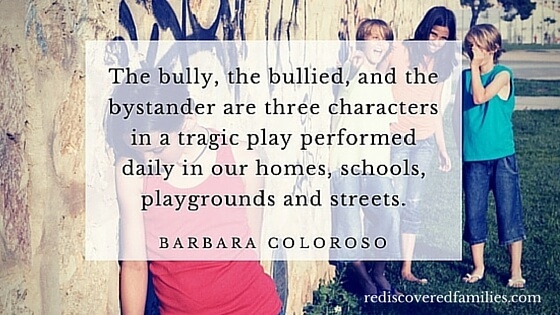 I really appreciate this quote from Barbara Coloroso in her book The Bully, the Bullied, and the Bystander. If we are to have any hope of addressing the issue of bullying in our schools we have to look at changing the culture in our school AND in our whole community. I understand that most parents want a quick fix. Your child is being bullied in school and you want the school to do something to make the problem to go away. I’m sure that educators, and administrators would like nothing more than to be able do that. Unfortunately it’s just not that simple. A student does not wake up one morning and decide to become a bully. It’s something that develops over time. Generally speaking bullies are made not born. Unfortunately we cannot hope to solve this problem with a quick “one size fits all” flashy program with lots of bells and whistles. 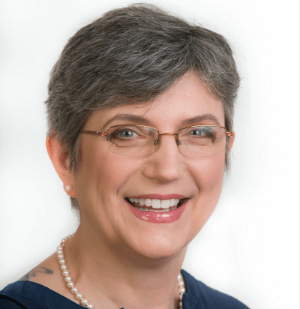 What we need are programs that focus on prevention rather than on management, because the things we have been doing so far don’t seem to be working that well do they? We need programs (and resources) to help us develop a positive culture in school, homes, and the community. We all need to work together to build the kind of environment where bullying isn’t tolerated and violent aggressive behavior is no longer supported. That sounds great, but what if my child is being bullied now? I would suggest you educate yourself. Knowledge is power and there are some helpful steps you can take. Then get ready to advocate on behalf of your child and every other child who is suffering. Ask about the procedures in place for reporting bullying at your school. Document every conversation. Find other parents whose children are being bullied and join together in your efforts. Recruit other community members to help advocate alongside you. Bullying has an impact on the whole community. It is not just a problem for schools, parents and students to solve. The website Prevnet Canada has a wealth of resources. 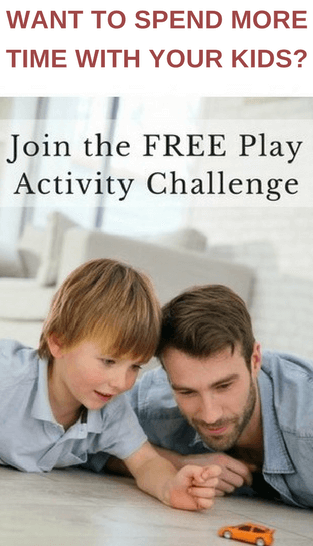 Parents click here to access information and practical strategies to help your children build healthy relationships and prevent violence. Educators click here to find great articles to help you deal with bullying in your classroom and school community. There are also resources for kids and teens. If you want to learn more about cyberbullying and what to do about it you will find some helpful information here. Read a helpful definition of bullying from the Royal Canadian Mounted Police. Learn about the difference between bullying, aggression and teasing. Has your child been bullied at school? What advice would you give to a parent dealing with this issue? 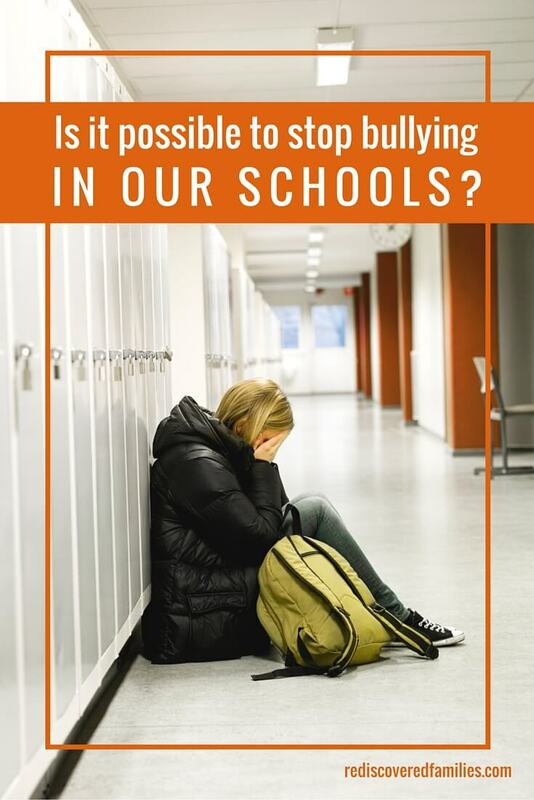 What do you think might reduce bullying in our schools? Has your school used an anti bullying program that has been helpful? Leave your comments below. We know how it feels to have your child bullied day and day out. Took 2 years to finally get something done about it “Why”. The bullying still goes on today. I’m so sorry you had to go through that Jerry. I don’t know why so many schools do not seem willing to do anything about bullying. I have known schools that have implemented successful anti bullying policies and programs. The teachers all seem to feel that it made their job easier. It is sad that bullying continues despite efforts. We have been lucky so far, but my children are still very young. Let’s hope they never have to face any kind of bullying. Thanks for visiting. It’s so sad and frightening to experience your child being bullied. My son has been bullied for most of his school life. He is in high school now and things haven’t improved! We’ve spoken to teachers, the principal, parenting experts and psychologists. We’ve tried to equip him with skills to cope – that seems to have worked to a point. I don’t think it’s a problem just for the schools to deal with – a lot of it comes from parents and their values (or lack of!). I personally think we all need to work together to raise our children to be less cruel, judgmental and nasty to each other…. but that doesn’t seem to matter to some people. I’m so sorry that you have had to go through this Lyndall. Sadly I have to agree that there is a lot of judgement and nastiness out there, even in our schools.There is an anti-bullying program in Canada called “Dare to Care” that involves students, teachers, parents and the community in an effort to eliminate bullying and other dangerous behaviours from their schools to create an atmosphere of tolerance and respect. It made quite a difference in one school I know. I love the idea of kindness being strong and breathtaking – beautifully put! I’d love to work those children who have been taught about kindness. We need to empower them to dare to intervene. Studies have shown that almost all bullying can be averted if a peer intervenes in the first 10 seconds.I know that is a very scary thing to do, but if we could train students to intervene as a group that would have a powerful impact. Most bullies are cowards at heart! I had to chat to a teacher about some bullying my son was receiving, and she was fantastic in her response. She said it wasn’t just about the boy doing it but those who were doing nothing about it and the school addressed the whole issue. You’re right in saying that a cultural shift is needed. That’s when things really change. It’s one of my biggest fears that my children will experience bullying as they get older. I’m amazed that bullying is still a problem, since awareness about it has been increased, but I suppose that there will always be mean kids out there. If any of my children do start being bullied, I’ll follow your advice to document to conversation and reach out to other parents. Thanks for the article. I hear you Hazel. There seems to be a lack of willingness in many schools to address the issue of bullying in an effective manner. In our area the schools the administration assures parents that they have anti bullying measure in place. Unfortunately they seem to be pretty well ineffective as a lot of bullying still goes on. I keep hoping that eventually things will change. Thanks for your thoughtful comment. i am here for the first time. Your blog took me in deep thinking about whether the bullying in the school will be stop or not. this is the main issue and reason of worry for the parent whose children are studying in the school. i wish this could get in control as soon as possible. keep sharing such information. You and me both Alice. The ability to drastically reduce bully is there, but often the schools are not willing. It is so sad. It’s unfortunate that the Canadian statistic indicates so many children feel they will encounter negativity on a daily basis. Your claims about the potential for long-lasting effects are valid ones.